Earlier this month we shared the perfect teal color, Teal Zeal by Glidden paint. It’s part of their new simplified color palette and we just adore it. Check out our many color inspiration ideas, so much eye candy for the home! This bench has been in our marriage as long as our oldest daughter has been. My in-laws gave me a gift card to Pier 1 back in the day, nearly 13 years ago, and I was so excited to have a real wood piece of furniture in the house. It was $250 and the gc was for $200. I was so thrilled with the black beauty and red distressed undertones. Fast forward, I don’t wear black. Ever. I don’t decorate with cool colors anymore. I don’t have 1 piece of black furniture in the house anymore either. It’s fun to find your style as you age and mature. I love the farmhouse, shabby look. It works perfectly for the cheapskate in me…thrifting is so fun! 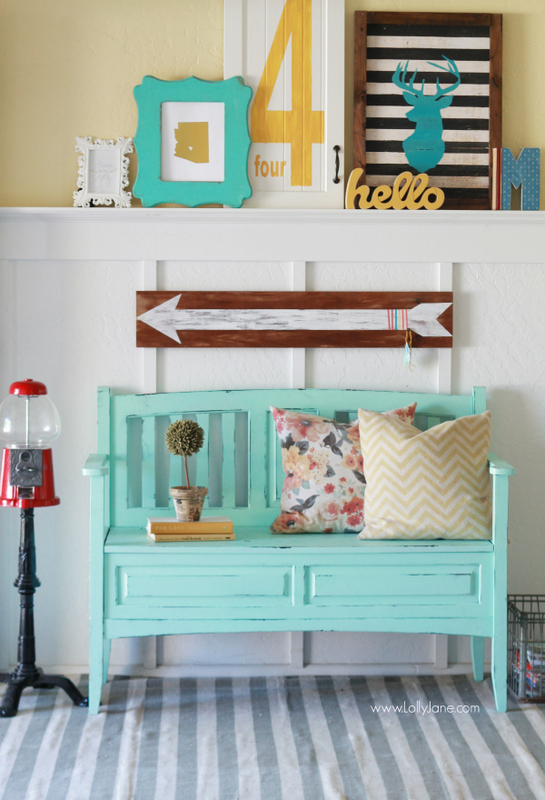 But this teal bench makeover doesn’t look cheap! In fact, it looks like a million bucks and now I’m set on keeping it in the family a little longer.